We were asked to take a look at Reading Kingdom for this review and when we started, I was unsure about how it would benefit Miss J. She was reading well and could express herself well, though she didn’t care too much for writing. She enjoyed typing though. Giving Reading Kingdom a try brought out some interesting things for us. These skills are really well explained in the PDF that is linked at the bottom of the page titled Why It Works. That page and the PDF will give you a really solid understanding of the program and how it is different from others on the market today. The program itself is really quite easy to use, though a couple less clicks to get started would be nice. Once in the session, the child just follows the directions for each of the activities in the lesson. The directions are spoken so the child does not have to read to get going. Miss J was working in level 4 of 5. I think she placed a bit low because the placement test threw her a couple of curve balls she wasn’t expecting. She did not capitalize her sentences in the placement. And there were several times that she clicked faster than the program registered so it counted some things wrong. All in all, though, she has benefited from her placement, even though it is low for her. The activities have so many different benefits that it is hard to explain, honestly. Some of the activities have the student recognizing the sequencing placement of the letters of the word. Some are looking a placement in a sentence. Another might have the student spelling the word. Another has the student recognizing it next to a similarly spelled word. Activities might have the student typing or clicking to input. Capitalization, punctuation, and sentence structure are all a part of the activities students complete in a reading context, not just an exercise for the one thing. Each lesson focuses on a particular word. Today’s lesson was rainbow. She has had cold, happen, saw, and small, to name just a few. When a word is focused on, the various ways to use the word are also covered (part of the semantics, syntax, and comprehension). With cold, for example, she also saw colder. With rainbow, she also saw and typed rainbows. With too, she had to identify it in context of a sentence that might have both too and to next to each other; she had to choose the correct one. The set up of each lesson is game like, without actually being a game. It is brightly colored and has sound effects (annoying to me but right up Miss J’s alley). In the upper right corner of the screen the student can see how many more parts the lesson has. There is also a way to pause the lesson or you can close it out before completely finishing it. The next time you log in, you come back to where you were. Reading Kingdom recommends the student complete one lesson a day at least four days per week. If you need to move along a bit faster, they say it is okay to do two lesson a day but recommend not doing any more than that. We have stuck with the one lesson per day, though we have honestly struggled to do four days per week. I think we are showing an average of 3.3 days per week. Yep – that is how detailed you can get with the information available from Reading Kingdom. And there are more reports available. I can download and save or print a report that shows me the progress of my class/student. For Miss J, it shows me which day she completed which lesson and her rating for it. The beginning of the report shows me how she did on each part of the assessment and how long it took her. If you have to track time on task, that is in the report as well. Another way you can see the progress is on the start page. There is a progress bar that is visible to show how much of the level is complete. There is another to show how much of the program is complete. Below that is a table with markers showing similar material. Overall, I think Reading Kingdom is a program that has a lot of benefits to it. I like the integrated approach to the multiple skills and I like that it is not taxing or difficult for Miss J. It is a program she can be independent with, which, as a 9 year old, is a big deal. I do believe that in the long run, we will see that having worked through the levels of the program that it placed her in has been of benefit. But it isn’t as visible as some other programs may be. We may not be able to point to a particular thing and say “That is what Reading Kingdom did for her.” I do believe she is benefiting, though. Miss J does not beg to do the lessons but she doesn’t complain about them, either. There are a couple of things she would change. The program repeats a lot and much of the work are things she knows. She thus feels she is doing things below her level or having to repeat things. What I am seeing, though, is her working well at words presented in context and being able to spell them easily at the end of the session. She is having to pay attention to what she is doing and her typing skills are definitely improving. Would I recommend the program? I don’t know. Not because it isn’t good but because I am not sure it is for everyone. My oldest two did fantastic with sight words and moved into independent reading quickly and easily. They would not have done well with this program because it moves carefully through each word. They have never struggled with reading, spelling, context, or any of those skills. This would not have worked with them. Miss J on the other hand has grown into her own reading enjoyment a bit more slowly and needs a bit more work on her spelling and writing. This is working with her on those skills. She gets context easily and understand much about grammar. But those are helping her with the other parts of this program. So it works for her. If your student is at the beginning of their reading journey, this would be a fantastic program. If they are farther along and can already read some but are struggling, this might be good for them. I have not found an assessment of any type that you can take prior to signing up with the company but reach out to them if you have questions. I am sure they would be happy to help you make your decision. There were a number of families with students at different levels and needs, including some with ASD, who were reviewing Reading Kingdom . See what some of the other families had to say about Reading Kingdom and ASD Reading by clicking on the banner below. Many of you are probably familiar with our vendor for this review: Allsaid & Dunn, LLC, publishers of The Reading Game and authors of the Wordly Wise series. We have been using a supplemental product titled The Magic Stories. Each story is fairly short; my 3rd grader could easily read the stories in a single sitting, with no need to break a story up over two or more days. The stories each have a magical element and conclude with a moral. The tales are fun, imaginative, and varied. Each tale includes a list of the Naughty 40 – a set of 40 words that are often difficult, misread, or misunderstood. Many of these words have synonyms. This list is included with the book PDF but is also a part of the series of worksheets that are included in the purchase of The Magic Stories. The worksheets are a printable file that comes with the complete set purchase. Each tale has a maze, comprehension questions/finish the sentences, real or imaginary/imagine questions, finish the story options, a running record, and a Naughty 40 word assessment sheet. 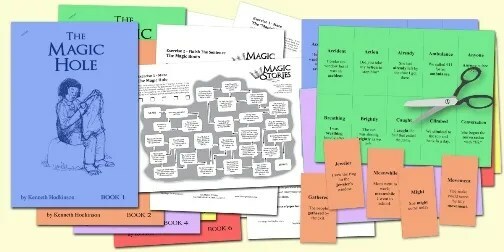 Each tale in The Magic Stories is accompanied by some worksheets, the first of which is a maze. The student reads a statement and then answers it true or false. If the student gets it wrong, they have to check a box at the top and go back the other direction. If they miss too many, it is a good indication that their reading comprehension needs work or they read too fast and so they are instructed to go back to the story and read it again. This was my daughter’s favorite sheet. She always followed the reading with it right away. Each tale is also accompanied by some worksheets that reinforce reading comprehension through varied questions. There are about two pages of questions that range from obvious answers to ones that really make the students think. The students have lines to write their answers on. One suggestion here would be to include age-appropriate lines, rather than just a single blank for writing. My daughter really struggles with her writing when she is writing on a single line. The real or imaginary/imagine questions are different from the reading comprehension questions. On the real or imaginary pages, the student is differentiating between real and imaginary and creatively thinking about some various opportunities and how real or imaginary would affect those. On the imagine pages, the student is asked to imagine a setting or situation related to the story somehow and to think creatively about a solution or idea related to that. There is also a worksheet that encourages creative writing. Each story has at least two options to choose from. There are suggestions for writing alternate endings, evaluating a character and talking about his choice, writing a new story for a character, or creating something completely different. Miss J did her creative writing on a word processing program on the computer and really enjoyed this portion of it. There is also a download of the Naughty 40 words as flashcards. We did not use these because Miss J seldom missed a Naughty 40 word. This is a printable file, a separate one for each story, that has the word printed in bold and then a sample sentence for the use of that word. It would be a great resource if you needed to drill any of the words with your student. This was a simple addition to our school day and was something that Miss J seems to enjoy. The quality of the story is really quite good and I was pleased. Too often stories for reading comprehension feel contrived and are not pleasant to read. These are enjoyable, fun, and brought good thoughts and ideas, as well as creative writing, to our days. If you are looking for a supplemental program to check or improve reading comprehension, sight words, and creative writing, check out The Magic Stories from Allsaid & Dunn, LLC. The publishers of The Reading Game and authors of the Wordly Wise series have created a product that is a pleasure to work with. From The Magic Stories: We would like to offer your readers a 25% discount should they choose to order The Magic Stories. To receive the discount, enter “raisingreaders” in the coupon box upon checkout. Visit the Homeschool Review Crew to read about how other families have used The Magic Stories and what they thought about them. Progeny Press is a company that brings to the table something I struggle with – deep questions related to a story that force a student to think critically about things. We have been reviewing the The Bears on Hemlock Mountain E-Guide. This study guide is aimed at lower elementary ages. It has been a pleasant experience. Bears on Hemlock Mountain is an early chapter book by Alice Dagliesh. The Bears on Hemlock Mountain E-Guide is produced by Progeny Press to go along with the book, chapter by chapter. My 8 year old (beginning 3rd grade) was able to easily read the book and use the guide. The guide does require quite a bit of writing, which is not her strong point, so we modified some of the longer writing answers for an oral narration. It adapted easily and well. The Bears on Hemlock Mountain E-Guide began with a note to instructors who are new to using this style of guide and it followed that with a synopsis of the book. Next is an author biography and a note on the background of the story itself (old folk story). There are a number of “Before-You-Read” activities to help the students become familiar with some of the background and ways of the people and places in the story. There were quite a few of these so we did not do them all. And then you get to the parts that go along with the story chapter by chapter. For the pre-reading activities, we studied animal prints with a poster we have, along with the different types of animal prints you might encounter in the woods. We also looked at trees, leaves, and bird nests. We discussed a hill vs a mountain and looked at some examples online. We also had a discussion about hospitality: what it meant, how you can show it, why you would, and more. Finally, we looked up several sites where we could listen to bird songs. The chapter by chapter questions are basically set up in two chapter sets. This made it very readable and if the child struggled to know the answer, there was not a very large area of the book to look to find the answers. Each chapter set covered vocabulary and comprehension questions. The vocabulary was both single words and muti-word phrases that the student may or may not be familiar with. Because it included some phrases, it was not always possible to just look it up in a dictionary. This meant that this was not independent work. That works well for my daughter because she likes company, no matter what she is doing. The questions relating to the chapters varied from comprehension to making inferences to apply Bible verses. An example of a comprehension question is “What does Jonathan do to keep up his courage?” This was a low-level comprehension question because the answer is almost completely stated from the story. A deeper level question was “Uncle James taught Jonathan observation. What is the difference between seeing and observing?” I liked this variation on comprehension questions because often you get either the really deep thinking questions or the low-level question. Progeny Press seems to have included a good variation of both in this study guide. The Bible verse questions were all application style questions. They asked you to read a verse, which was provided, and apply it to a particular situation in the story. An example of an application question for a verse had to do with reading a passage from James and then discussing being dependable and telling the truth. The student had to think about being dependable, telling the truth, and why those things may or may not go together. Then the student was asked if you could have one without the other. What a wonderful, deep application question that wasn’t too difficult but required some serious thought. The final part of the study guide was a page of mystery words. The student had to recall some words from the story and then use them to solve yet another word that was coded. Overall, this was an age-appropriate and ability appropriate study guide for my daugher. This was the first of its kind for her and while she didn’t love it, it worked pretty well for her. It was easy and followed the book well so she could easily hunt things up if she needed to, except for the last set of chapters. For some reason, it went from two chapters in a group to four in the last group. That made for a very long set of questions and a pretty big group of chapters to search through when she wasn’t sure of something. I would also have liked to see some “after you read activities” included in the guide. I felt like this guide is definitely missing a hands-on set of activities, as it doesn’t have any except for the pre-reading activities at the beginning. Click the banner below to read their reviews and find out more about Progeny Press. K5 Learning is a supplemental, online program that is designed by educators and intended for anyone needing to strengthen their reading, math, or spelling skills. Both home educated students and public school students alike are the target users for this program. K5 Learning has three main components – reading, math, and spelling. The reading instruction is intended to help students in phonics, sight words, and reading comprehension. Math is intended to assist students with numbers and operations, geometry, and data, along with beginning algebraic thinking. The spelling portion of the site is a combination of spelling and vocabulary building. When a student begins with K5, it is best to begin with an assessment. This is designed to help place the student at the lessons that will most benefit the student. It takes about 20 minutes to complete each assessment, a total of about 40 minutes as there are separate assessments for math and reading. We found these assessments to be fairly inaccurate, especially in the phonics department. After completing the assessment, each time the student logs in, she is taken to a page to choose either math, reading, or spelling for the day. Clicking on the category takes the student to the beginning of their activity for the day. The student is then taken through an online lesson that consists of stating the object, instruction, practice problems, and then an activity. Each page has a button at the bottom that is supposed to allow the student to stop and save their work. This is where they should be returned the next time they log in to this category. While these are all really nice things, we found that K5 did not meet the needs of our family. I will start by talking about the assessments. I expected Miss L to assess out of the program in reading, as she reads and comprehends at a very high level and her spelling is excellent. She tested at 2nd grade levels in phonics but those lessons were completely inappropriate for her age and ability. There was no way for me to see what specifically she needed to zero in on, if anything, related to phonics. Her reading placements put her at high 5th grade but even those lessons seemed below her ability. It was not pleasant or helpful for her to complete these lessons. In math, Miss L placed approximately where I expected her to – right on level. I felt like this assessment was probably accurate but the instruction was a very poor fit for her age and ability. She was unable to work with the instruction and program without extreme frustration. We did not make her continue with the program. I felt as though her reading assessment was off. While the numbers for placement looked good, the material was almost all review for Miss J. She was working on phonetic material that she had completed easily six months ago and the reading was below her abilities. Miss J’s math assessment also seemed off. It had her working on materials that she completed a while back, while also having her work on things that she did not know anything about yet. It was kind of a mixed bag for her, though technically it was showing her as placing at a low 3rd grade level (a bit higher than she is currently working in her curriculum). We encountered several issues, aside from the assessments. One of the biggest? Miss J had to repeat assignments that she passed a number of times. In particular, there was one series on reading comprehension that she had to repeat a total of five times before it moved her forward. I did contact the company and they told me that she had to pass it with better than 65% to move forward. Well, she had. I had sat beside her for 4 of those times and she had gotten everything or almost everything correct. We would log out and log back in, and it still made her repeat it. We were just about to give up on the program completely when it finally let her move forward. This came up another time, as well. However, this time she only had to repeat the lessons three times before moving on. One of the biggest issues I had with the repetition is not that she had to repeat – after all, relearning material can really help in the long run. The issue was that the repeat was just that – an exact repeat: same lesson, same words, same passages to read, same questions to answer. After the first time through a reading passage, it is no longer a reading comprehension exercise; it is now a memory exercise. This is not helpful if the student is truly struggling with reading comprehension. Another issue that we saw was in the math instruction. Miss J was working on multiplication. The lesson began with a image of some arrays that was intended to assist her in solving the problem. But after the first reference to the arrays, all other discussion was done without referring back to the image. The image for the problem is never tied to the method of solving it. We saw this same sort of thing occur in many of the math lessons. The picture appears, and then is ignored in the instruction. In math instruction, we did not feel as though there was actual instruction. Most of the time, multiple problems were walked through, step-by-step. Lack of instruction meant that I had to sit with Miss J for the duration of her work on the program so I could fill in the missing information for her. I realize that this is a supplemental program but, as such, student who are needing additional practice need additional instruction. I expect a supplemental program to provide that piece, especially since K5 is designed with an assessment to help place the student where they were having difficulty. Additionally, I had to instruct her on how to answer questions. The input of answers was not intuitive for the student and problems were often not lined up logically. Problems did not have the tens and ones places lined up vertically. Some problems had to have commas inserted for the answer to be counted correct; others did not. Adding those commas often misaligned the columns. Just another bit that makes it hard for the student to not get frustrated. Timing was another issue. If a student knows an answer, it is detrimental to their concentration to have them have to wait out all of the talking the program does before they are allowed to answer the question. More than once, frustration built up because our students had to wait to type in an answer. At other times, the answer was timed and if the student took too long to type it in, what they had already worked out was erased and they had to start over. This was especially true in the 5th grade level math. She often had no idea that it was going to be timed until after she had already had an answer erased. Again, this built frustration and did not help in her learning skills that needed practice. At the late 2nd grade level, a student does not need everything read to them. This is a great option but it should be just that – an option, not an automatic feature. This took up a lot of time and Miss J often lost her concentration while waiting on the voice to stop talking so she could answer a question. I think that there are probably some very beneficial things about this program. However, after our experience, I wonder if this is not a program that the student needs to begin when they are younger. If they had grown with this program, perhaps we would not have met with all of the frustrations and issues that we did. All in all, this just was not a good fit for our family. 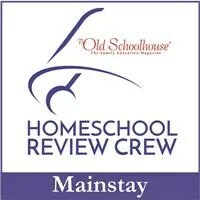 Read additional reviews by members of the Homeschool Review Crew by clicking on the banner below. One is never too old to study legends to go along with the every day. So this week, we are delving a bit into Texas history through bluebonnets and indian paintbrushes. These beautiful flowers flourish in Texas this time of year. Last Friday, we took a field trip to bluebonnet fields and spent the day relveling in the beauty of large fields of flowers. These flowers are the quintessential picture of Texas for many people and the legends that go along with these flowers are beautiful. They show love for community and acts of self-less-ness. So, this week, we are going to pull out The Legend of the Bluebonnet and The Legend of the Indian Paintbrush. Both of these legends are interesting and beautiful. No only do we learn and revisit these stories but we will learn a bit more about the people who created these legends. Yes, these are very generic ideas that will come to fruition as we decide on which activities to explore more deeply and which ones to not include in our learning at all this time around. We revisit ideas as we explore topics and books and stories and subjects that we find interesting or different. This is one of the lovely things that we sometimes forget about our schooling – we don’t have to cover it all in depth because things will come around again and we will learn more the next time. So, my goal with these books is to give the oldest giggly girl, who is in 7th grade, more freedom to explore her areas of interest with the book on her own and create a presentation for her sisters. The middle giggly girl (5th) will probably do a couple of the simpler topics and join with her younger sister in others. The youngest giggly girl (2nd) will be working with me to delve into some things that she either hasn’t done yet or needs to revisit in a more in depth way, such as the plant labeling. I challenge you to pull out a legend, or any story really, and find some related activities to do and see if the connections don’t help the information stick. It may seem crazy to some people to be reading out loud to children who are completely capable of reading for themselves. It isn’t. The research is more than compelling about the benefits of read out loud. But, more than that, it is great family bonding time. It brings us together, gives us a lot more to discuss, brings new words and ideas into our language and thoughts, and so much more. I am currently reading The Read-Aloud Handbook by Jim Trelease. It is not the first time I have read it but it just as fascinating this time through as it was the last time. Mr. Trelease goes through a bundle of research on the benefits of reading aloud. He also gives a large amount of anecdotal research and background. These are a joy to read as they encourage and support our choices and understanding in this area. The second half of the book is a treasury of titles and short summaries of books that are good read alouds. I plan to go through these and mark the ones we have done, as well as the ones we want to do. I have looked through this book before, but it was a loaner from the library so I could not mark in it. This time around, I bought my own copy so I can mark it up as I wish to. It was not too expensive at a big-box book store and I am so glad that I have my own copy. This is one I think is a “must-have” for homeschoolers and parents who want to do the right things by their children. I am actually considering making it a baby-shower present. I encourage you to read it and to take up reading aloud to your children. Everyone will benefit.